Just thought I would update you guys on the show time for tomorrow. I am going to be doing a Craft 4 Day Deal. Its simalar to a Pick of the Day in that there will be shows over Saturday and Sunday, but the offer is available for the next 4 days from the day of launch. Sunday – 10am, 1pm, 4pm and 9pm. Well, I better get stuff sorted before the day ends …. It’s still raining here in Northampton 🙁 but I am still on a high from my Saturday night. I went over to a village called Stanwick, Lynsey had told me that there was a band, called the Houndogs, on at the local club. WOW, what a night. It was great, what an amazing performance from a band consisting of 3 brothers, they totally blew me away. It was one of the most lively, energetic and entertaining acts I have seen for a long long time. 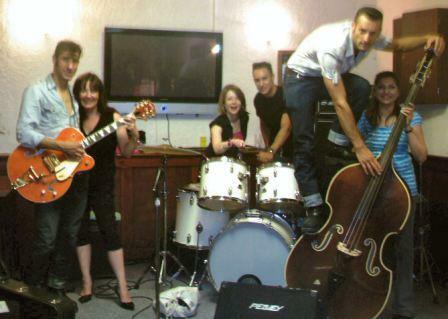 They are a rockabilly band that have so much passion for their music that YOU can feel it. I was fortunate enough to meet the 3 brothers, Robert, Ian and Dave, they are the nicest people. They even entertained my idea of having pictures taken with them and signed a CD for me :-D. These guys really need to be signed !!! And, whoever sits around and thinks about it will be so disappointed when someone else pips them to the post. 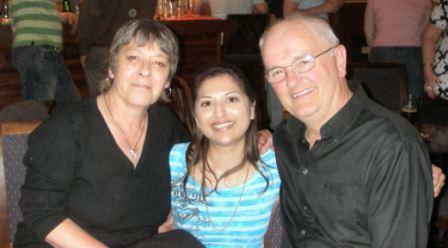 Two of my most favourite people in the world 😀 Janet & Graham, it was lovely to see them both again. 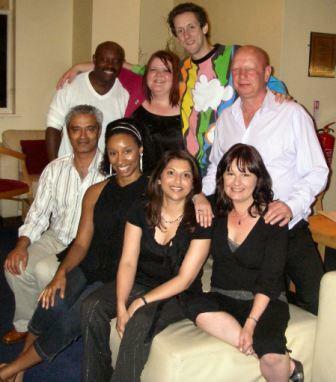 We all used to work together in Room 11 of our building. It was a tight squeeze of at least 10 techies in one room with Trev and his assistant (Lynsey then Jen). A new manager came with an evil plot. He disbanded our team and we ended up scattered between 2 sites. At this point, some of us decided to leave as we were really unhappy, we missed each other and it wasn’t the same. I hadn’t seen some of the guys for over a year and a lot has happened since then …. to all of us. New jobs, new news and much more. Congratulations to Jen, she passed her driving test, on her first go too !!! We all missed a few of the guys, who didn’t turn up, it was the normal work phone call scenario, “I’m really not well, got a bad back….. got man flu…. ” You know who you are guys, it’s not 0n LOL. Next time eh? Heat Gun – this is necessary, it is much hotter than a hairdryer and supplies a controllable jet of heat that you can direct on to your image. Embossing Inkpad – this is a clear, tacky pad which has a slow drying time. A coloured pigment inkpad can be used or any pad that is very wet and will stay wet long enough for the powder to stick to it. Embossing Powder – these powders come in a variety of colours and textures. Available in coloured, metalic, destressing, glitter, etc, there are new varieties in the stores on a regualr basis. The only other requirements are a stamp, some card and a tidy tray or sheet of scrap paper for the excess embossing powder. Ink up the stamp and stamp the image onto the card. 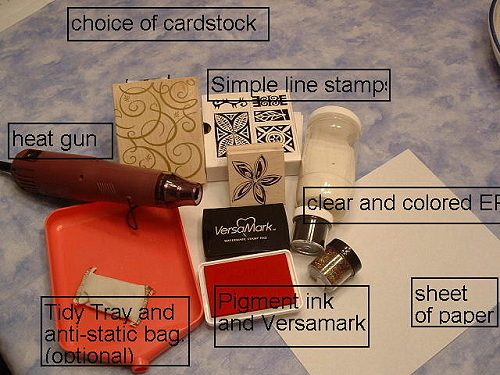 If using a VersaMark or a colourless embossing ink you will only see a very faint image. Before the image dries pour on the powder over the whole image. Tip off the excess onto a sheet of paper or into a tidy tray and put back into the pot. Tap the card to get rid of any extra powder from the image. The next stage is the most exciting. Take the heat gun and start it up. Starting at one point aiming the heat gun at the image about 3 inches away then wait until the powder starts to melt. Move the heat gun and “chase” the melting powder until the whole image is embossed. You will quickly become used to the amount of time this takes and you can see the transformation happen before your eyes! TIP – Try not to wave the heat gun around as there is a danger of missing part of the image. If this happens, the powder on the parts that have not been heated will fall off and you will be left with its missing. It is better have a steady hand and be methodic. That way the whole image will embossed. TIP – If heat embossing for the first time, do not worry if it goes “wrong”. It just needs a little practice, it is very easy to master. TIP – Do not over heat your image. This is easy to do if you are new to heat embossing. If over heated the mage will raise, which is what should happen and then will go flat. The card will absort the powder, which is what you do not want. Embossing works well on paper and card – you can also emboss onto fabric, wood and glass with a little practice! Once you have mastered heat embossing with stamped images, there is a multitude of other techniques to be learnt,for example, ultra thick or triple embossing to name but one. Triple embossing is building up layers of embossing powder. Taking a pigment ink or embossing ink, apply to card. Pour on powder and melt. Sprinkle on more powder while still hot, reheat and repeat. The next is optional: while still warm, stamp into the heated powder using an inked stamp to create a debossed image into the powder. If you do not use a stamp, you can leave it and you will have a tile effect. Special Ultra Thick powders are available for this effect, but it works just as well with a few layers of normal embossing powder. As you know from one of my previous posts, I have been asked to provide a workshop at the Hilton for the Create & Craft Experience. This is just an update to let you know that there are a very few places left and if you want to book, have a look at the Create & Craft website, where you will find a link to book your place. I had a great day out on Saturday with Lynsey, we went to Stow on the Wold and Bourton on the Water as planned, but then ended up in Milton Keynes for a Spanish meal LOL. Lynsey’s sunglasses were murdered on the day, she dropped them and I managed to tread on them, the timing was perfect LOL. Hope to visit there again soon on an equally beautiful day …. Anyway, I have uploaded a calender now and you will be able to see it under Events Schedule at the top right hand side of the page. I have started filling it and will update as soon as I can, every time I have more dates. To book onto the event, contact Create & Craft, there should be a number on their website.